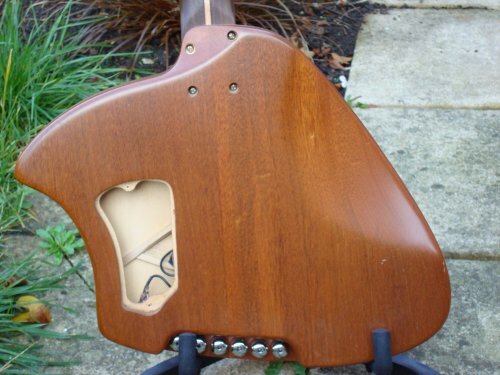 Ergonomic acoustic guitar design has largely been limited to evolutionary change in part influenced by the thought that an acoustic can’t sound “right” if we deviate from traditional construction methods. 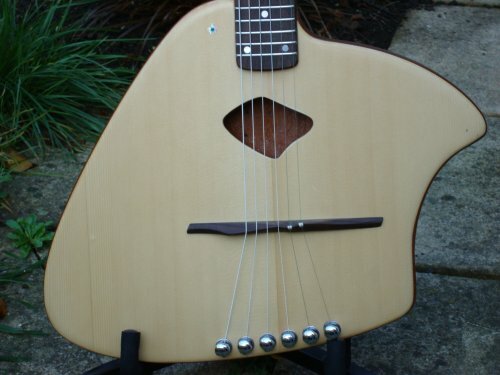 Enter the revolutionary MaSh headless acoustic guitar. It’s the brainchild of musician Henry Olsen who’s played with the likes of Velvet Underground members Nico and John Cale and is probably best known for his bass work with Primal Scream from 1988-1995. 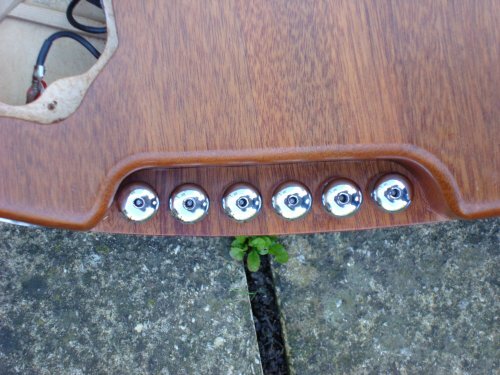 Built by U.K. luthier Dave Dearnaley, the instrument is influenced by the Klein guitars Henry owns and loves both of which are no “ordinary” Kleins. You see, guitars #102 and #104 were previously owned by Bill Frisell. Serial #104 is particularly notable for having been played on Nashville and Good Dog, Happy Man. Henry took his experience with them and applied them to his acoustic guitar concept. The guitar is exactly what I wanted. It is as loud acoustically as my Gibson ES125T, as comfortable to play and hold as my Klein and will fit easily into any overhead locker in a train or plane. I miss the top arm rest, which we couldn’t design into the body, but I’m more used to it now than I was at the beginning. And as you would expect from an ergonomic guitar, the instrument is well balanced and light weight. The MaSh weighs in at a feather weight 4lbs. 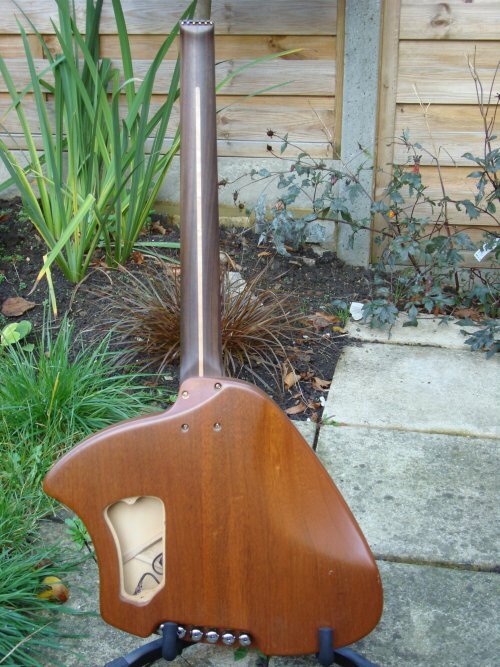 Neck – one piece Indian rosewood with a truss rod, 24 frets and Fender-type nut. (Note the skunk stripe). Savarez Argentine Gypsy Jazz Acoustic Guitar Strings – Henry describes these as giving the MaSh a more North African ‘aroma’. It’s worth noting that the Steinberger tuners proved somewhat problematic. Out of two sets, two tuners were faulty out of the package and two disintegrated during installation. Yet another failed after only a week! Nonetheless, Henry is sticking with them. The mahogany and rosewood are salvaged wood from an old bank – important in a world where woods for guitar making are increasingly limited. The next several shots give us a closer look at some of the details on the MaSh. It has the acoustic sound of a hollow-bodied Thinline Gibson, e.g. 125, 330 or Byrdland but produces more volume. Low mids are weaker, bass is hardly present, but all other frequency bands are well-represented. The acoustic contact microphone in the body does an excellent job and with EQ boost, the guitar sounds quite rich and full, with the sound tending more towards a Maccaferri than a Martin or Guild. I prefer to play the guitar acoustically. I use Dugain ram’s horn picks and a Selmer Stadium 14 W combo or a Fender Princeton Reverb when I (rarely) need an amp. 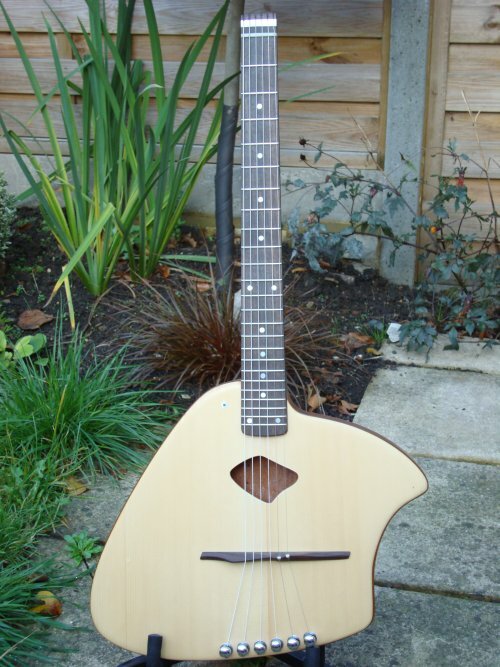 From everything Henry has shared, the MaSh acoustic guitar is a great success both musically and ergonomically. Consider that this guitar is essentially a proof of concept and it’s even more impressive. Imagine what further tweaking might accomplish! 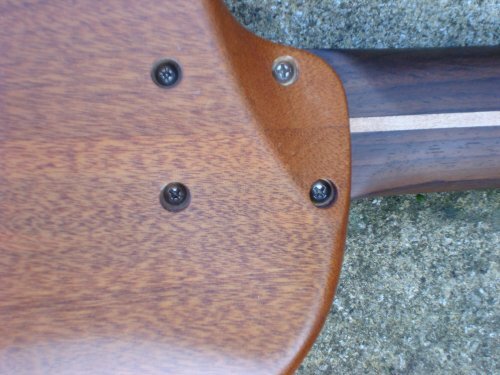 Its very success is a challenge to guitar makers to explore new territory as the MaSh clearly shows that there is a great deal of room for successful experimentation in designing acoustic guitars. Many thanks to Henry Olsen for his wonderful guitar design as well as the pictures and details that made this article possible. Just got the link to see this. Kudos to Henry and Dave. I know Henry had it in his mind for awhile. To get it out through another’s hands is cool. If I ever get there henry, this is the first one I want to play. Carl – Thanks for the comment. I’m equally impressed with Henry’s ability to convey his vision and I can only hope this collaboration with Dave continues. They clearly make a great team. It’s neat to see the Steinberger Gearless tuners applied to an acoustic instrument. That’s what I call thinking outside of the box. I’m glad to see their use as well although the problems noted with two sets are disconcerting. As to the overall design, I’m intrigued by the use of a billet of wood to make the back. Apart from the contouring it makes possible, it also suggests the use of alternative materials like fiberglass and carbon fiber to form a guitar back. Ovation already uses composites for its round back design. Why not contour them extensively? I’m wondering why standard keyed tuners weren’t used here. They’re probably cheaper, more reliable, and look like they might be more ergonomic on this guitar. I’m thinking of a configuration along the lines of the Koll RE 7/6 pictured at Koll Custom. The Players page at the same site shows Elliott Sharp playing a similar model with what looks like a Novax ‘fanned fret’ neck. Does anyone have experience with these neck configurations on Klein-style guitars? (.. and does it improve things ergonomically)? I suppose you could even add the neck twist here to take it up a notch – would certainly be a challenging project. Standard tuning keys would be cheaper but would require separating the tuners even further. The Steinberger tuners let you bring them much closer together. One alternative is the use of banjo tuning keys instead of the Steinberger tuners. Very nice. Takes the Klein inspiration and realizes it really well as an acoustic. They’de love this here in Nashville. I like the tuning peg idea… trying the same thing on a build I am working on currently, can check it out at sirenguitar.web.officelive.com if you want. I am using the staggered approach where there are two, staggered rows of tuners rather than one wide one… I was wondering how well the strings stay on the bridge/saddles when it is space the way this one is?? Any way, this is a great solution to the overpriced and finicky headless bridges, plus I think it will have great sustain when I finish.